What would you say if I told you that you can make your own magic? I promise you that by the end of this blog you will know how to create a big pile of magic in your very own backyard... and you won't even need a wand! You see, Harry Potter might need a wand but not me! All I need is a shovel and some left over morning tea!... seriously. Have you guessed what I'm talking about yet?? Compost rocks! I love compost because it's free, it's fun and it's great for our planet! I call it magic because it's how I turn food trash into treasure! Compost is my secret power when it comes to growing my own food. And if you keep reading, you can have this magic power too! That banana peel that you are about to put in the rubbish bin - don't! Did you know that you can use that peel to grow a whole new bunch of bananas! How? Composting turns our food scraps into soil to grow new food. Magic! Knowing this makes putting food scraps in the rubbish bin seem like a real waste, doesn't it? That's because it is - when we do the smart thing and compost our food scraps, we're treating them like a 'resource' instead of a 'waste'. Resources are things we can use! Resources Rock! Do you know what's in food scraps that makes them so useful? Your fruit and veg scraps have goodies inside them. Another word for these goodies is "nutrients". When we turn our food scraps into compost, these nutrients have a way to go back into our soil. Once the nutrients are in the soil, our plants including our fruit trees and our veggie seedlings take up these goodies through their roots (a plants roots = their mouth!) Yes, that’s right. Plants eat the nutrients in the soil. This is how we keep nutrients in the food cycle. Later when we eat the plants, like tomatoes and lettuces and avocados and …bananas… we send all those awesome goodies into our bellies! It's a cycle - a nutrient cycle. 1. Composting turns food scraps into soil! 2. Composting turns our organics into resources instead of waste! To get your compost rocking, here are two of my favourite games. What can go IN compost the compost bin! Ask each other: was this once alive? Can it rot or not? "ROT" goes in the compost bin . "NOT"- does not. Ha! it’s made up of layers. I call this compost lasagna because just like the lasagna we eat… it’s made up of layers. Layers of brown stuff and layers of green stuff. The other two ingredients we need is oxygen for the air and water. To build scraptacular compost lasagna you have to remember a few simple things. Pop your compost bin or pile in a semi shady spot. If it’s really hot where you live you might want it in a very shady spot. You will be visiting it every day so make sure it’s easy to get to. Your compost pile needs to have air flowing through the bits and bobs in it - oxygen is necessary for decomposition (cool word, huh?!). A big person may like to get a spade and turn the whole lot over every month or so. The brown stuff is dry stuff. Cardboard is made from tree so it was once alive and will ROT and breakdown to make great compost. Add some sticks and leaves- there were once living plants so they will ROT too. The green stuff is the wet stuff. Pretty simple really - it's gooey stuff that's fun to get your hands into! Keep playing and layering until you've added green and brown all the way to the top …eventually. This is a game you can play and play and play…everyday! And there you have it - compost lasagna! Listen to your compost - it will tell you if it's getting too wet. Your compost should have a slightly sweet but not sickly smell. And it shouldn't smell terrible...that’s a true sign that something’s not right in compost town. 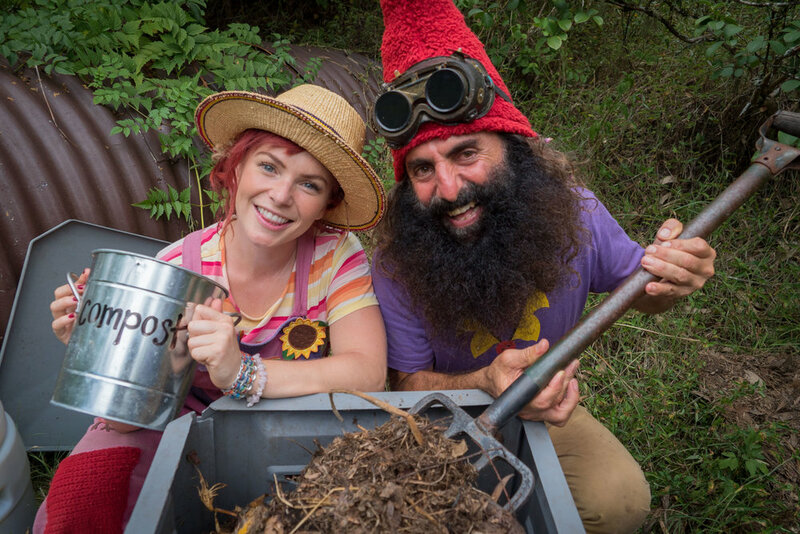 So you actually listen to compost with your….nose! Your nose knows…so pay attention to what your compost is smelling … I mean, telling you with its smell! If your compost gets too wet, you can put it back on track by adding more of the Brown layer goodies - things like sticks will create the air pockets your compost is craving! I'd better get going - I need to turn my compost over! Stay tuned for my next blog post which will be NEXT LEVEL expert stuff on HOW to keep your compost rocking!! I have some seriously good tips that will make getting your compost right, sooo easy!